Thousands of badass, tech-savvy women took over the Castro earlier this month, descending on the heart of San Francisco’s gay community for the annual Lesbians Who Tech (LWT) + Allies Summit. On the sidewalks, in shops and cafes, and in tented venues pumping with music around Castro Street, women from as far away as South Africa were out in force for three days of keynotes, workshops, networking, recruiting, and mentoring events to celebrate LGBTQ+ women. LWT’s mission is to increase visibility and intersectionality, and change the face of technology. Now in its sixth year, the LWT gathering was founded by a visionary woman who wanted her colleagues in the tech industry to have a conference for LGBT women, trans and nonconforming individuals, LGBT women of color, and others underrepresented at tech conferences and LGBT spaces. “I started Lesbians Who Tech six years ago now because, I’m starting a company, I’d been in the LGBT space, and I felt like I didn’t have a squad. 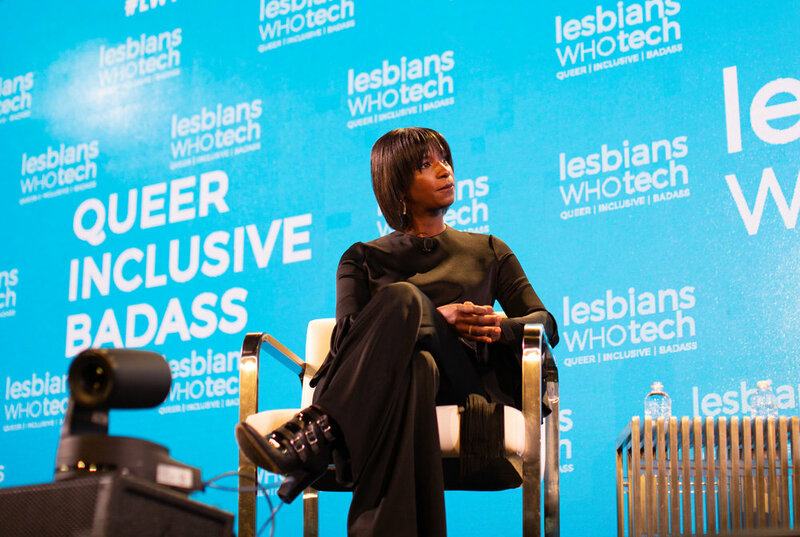 I didn’t have other queer women to talk to, to talk to about starting a company,” LWT founder and CEO Leanne Pittsford told a crowd of 6,000 attendees from the stage of Castro Theater. Last year Pittsford founded include.io, which helps underrepresented techies find jobs. Turns out she was right. “There are 50,000 lesbians and nonbinary folks and allies around the world,” Pittsford said to thunderous applause, celebrating LTW’s fast-growing global tech community. Today, LWT + Allies is the largest LGBT technology community in the world, and its annual Summit is the largest professional LGBT gathering in the world (and the largest event for women in tech in California). The organization has events in 40 cities around the globe, and through its Edie Windsor Coding Scholarship, has taught 100 gay and nonbinary people to code. Windsor was an IBM engineer and lead plaintiff in the landmark case in which the Supreme Court struck down federal law that defined marriage as only between a man and a woman. During the three-day conference, sponsored by dozens of tech companies and corporations, from Google to Walmart Labs, attendees could see product demos and network with vendors at the LWT “tech crawl,” and meet mentors at a career and mentor fair. Recruitment zones with vendor booths were open all day, while breakout sessions featured speakers, most from tech companies, giving talks about engineering and app development, scaling startups, AI and machine learning, cybersecurity, and changing the culture in Silicon Valley. The keynotes on the main stage of Castro Theater were deeply inspiring and often uproariously funny. Black Lives Matter co-founder Alicia Garza, U.S. Senator Tammy Baldwin, former Georgia gubernatorial candidate Stacey Abrams, San Francisco Mayor London Breed, and Emerson Collective founder Laurene Powell Jobs spoke about trailblazing, leadership, and fighting bias and exclusion. Abrams talked frankly about still being angry about the 2018 Georgia governor’s race, which she narrowly lost to a Republican amid allegations of voter suppression. “I’m angry and sad, but I don’t know how to be still anymore. Because I believe we can fix what is broken and we can make right what is wrong,” Abrams said. Not surprisingly, she said the biggest threat to democracy is voter suppression. “Voter suppression works by convincing people, either in practice or through a psychic sense, that they don’t count. And what tech is designed to do is break barriers,” she said. Facing down gender and race inequity in tech takes guts, especially for women just starting out in their careers, said Carin Taylor, Chief Diversity Officer at enterprise software company Workday, who spoke on a panel about redefining Silicon Valley culture. “It’s pretty simple,” she said. “Be brave. We are fearful to have conversations with people, especially around race. For me it’s about how do we shed away those stereotypes of who we think people are and really step into having those conversations.” What’s more, there need to be more STEM programs for elementary school children and a more welcoming environment for young women interested in tech, said Taylor. Many speakers urged the women in the room to push beyond the fear and assumptions they may have about being different and embrace their power. “I remember the early struggles I had. I was just out of college and was thinking about running for local office,” said Senator Baldwin, the first openly gay person elected to Congress, the first woman to represent Wisconsin in Congress, and the first openly gay person elected to the U.S. Senate. She wanted to run, she said, but there were no role models and she truly believed she would have to make a choice between going into public service and living life with integrity as an out lesbian. “Then I kind of figured out I could do both, and doing both didn’t mean I was going to lose an election. I did both and won,” Baldwin said on the main stage. “We are better when government and our legislative bodies reflect America.” That means more women at the table, including mothers, those who have experienced sexual harassment or assault, those who have experienced discrimination. Baldwin said she would be reintroducing the Equality Act this month and believes it will be passed by the U.S. House of Representatives, where Democrats are in control. The act would amend the Civil Rights Act of 1964 to include sexual orientation and gender identity to its provision. “It will be historic when it passes the House, but I have a feeling we have more work to do in 2020 before we get the Senate to pass it and a president to sign it into law,” she said. The 2018 midterms, where a record 117 women won elections across the country, shows that things are changing.